Acute knee dislocations are rare orthopedic injuries but represent a myriad of soft tissue and bony damage to the knee that can potentially result in limb loss if mismanaged or misdiagnosed. Injury mechanism can help delineate the type of dislocation. 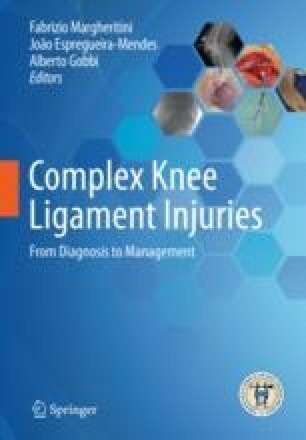 The Schenck/Wascher and Moore classification systems exist to clarify injury based on ligamentous injury, arterial injury, nerve injury, and fracture pattern, if present. Assessment of these injuries begins with vascular examination and urgent closed reduction when possible. Advanced imaging studies are often delayed until any potential vascular injury has been excluded or treated and reduction of the tibiofemoral joint has been achieved. Initial stabilization entails either splint, knee bracing, or possible external fixation when closed reduction cannot be maintained or persistent malreduction exists. Based on physical examination and advanced imaging studies, surgical reconstruction of the injured ligaments is performed in a sequential fashion. These will include the anterior cruciate ligament (ACL), the posterior cruciate ligament (PCL), the medial collateral ligament (MCL), the posteromedial corner (PMC), the posterolateral corner (PLC), and any combination thereof. Postoperative rehabilitation will be guided by injury severity, surgical reconstruction, and patient host factors with the goals of returning to normal activities of daily activity and work, military duty, or sports activities at the same level of participation.